© Mark J. Rebilas-USA TODAY Sports Texas Tech Red Raiders quarterback Patrick Mahomes II has declared for the 2017 NFL Draft. Texas Tech quarterback Patrick Mahomes II is leaving school early to declare for the 2017 NFL Draft. He made the announcement in a press conference on Tuesday morning. “I am foregoing my senior senior and declaring for the NFL draft this is the best decision for me and my family going forward. With my love for Texas Tech this was a very hard decision,” Mahomes said, per the Lubbock Avalanche-Journal. This is a move that came as somewhat of a surprise but that isn’t all that shocking upon reflection. The quarterback market is strikingly barren right now across the NFL. Quality starters are hard to find, and any quarterback with the potential to become a franchise passer will be in high demand. One of the most prolific passers in recent college football memory, Mahomes possesses a cannon for an arm, and he broke an NCAA record in a game this season with the most passing yards in a single game. Passing for 5,052 passing yards and scoring 53 total touchdowns, he has the ability to distribute the ball all over the field. There simply isn’t a throw he cannot make. It is going to be interesting to see where Mahomes ends up landing. There are some dire needs at the quarterback position around the league. Given that fact, it wouldn’t be surprising whatsoever if he ends up being drafted in the latter stages of Round 1. Texas Tech quarterback Patrick Mahomes II announced at a press conference Tuesday he will forgo his senior season and enter the 2017 NFL draft. Bruce Feldman of Fox Sports reported the news. The Tyler, Texas, native is coming off a huge season for the Red Raiders that saw him lead the FBS in passing yardage (5,052) and total touchdowns (41 passing and 12 rushing). Although the Texas Tech offense has long been conducive to big-time stat production at the quarterback position, Mahomes appears to be more widely regarded than his predecessors in terms of NFL draft stock. Bleacher Report's Matt Miller recently spoke with an anonymous NFC scout who ranked Mahomes fourth among quarterbacks in the 2017 class behind only Notre Dame's DeShone Kizer, North Carolina's Mitch Trubisky and Clemson's Deshaun Watson. Miller predicted in his latest mock draft that Mahomes would be selected with the No. 62 overall pick in the second round by the Kansas City Chiefs. While the Red Raiders went just 5-7 in 2016, Mahomes enjoyed a historic campaign that included a record-breaking performance against Oklahoma in which he tied the FBS single-game record with 734 passing yards and broke the record for total offense with 819 yards. Per RedRaiderSports.com (h/t ESPN.com's Max Olson), Mahomes put up dominant numbers despite playing eight games with a sprained AC joint in his throwing shoulder and five games with a sprain in his non-throwing wrist, which required surgery. At 6'3" and 230 pounds, Mahomes has prototypical size at the position to go with his big-time arm. In addition to that, he boasts great mobility with 845 rushing yards and 22 rushing touchdowns in three seasons at Texas Tech. Mahomes' skill set is rare, and it is easy to see why there is more intrigue surrounding him than previous Texas Tech quarterbacks, such as Graham Harrell, Kliff Kingsbury and B.J. Symons. Another big year at Texas Tech could have potentially solidified Mahomes as a first-round pick, but upcoming quarterback classes appear deeper and more talented than what 2017 has to offer. Also, entering the draft saves Mahomes the risk of suffering further injury, which would have been a major concern with how often the Red Raiders throw the ball. The draft is often about guesswork, and that is even truer when it comes to Mahomes, since scouts will be forced to differentiate his individual talent from the offense in which he played. With so many teams looking for a franchise quarterback and so many question marks surrounding the other signal-callers in the 2017 class as well, however, Mahomes has a golden opportunity to secure a high selection with a strong predraft process. Another underclassman quarterback is headed to the NFL. 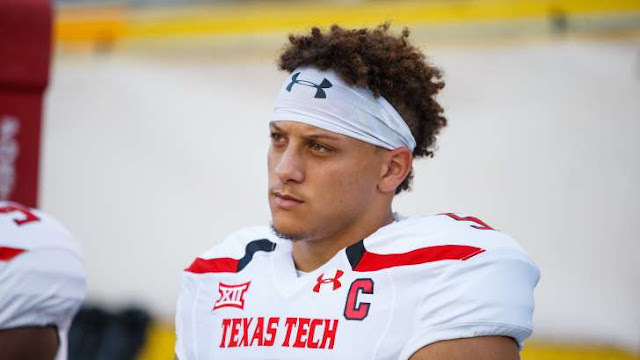 Texas Tech junior Patrick Mahomes announced in a press conference Tuesday morning that he will forgo his senior season and declare for the draft. Mahomes led the country with a whopping 5,052 yards in the Red Raiders’ pass-happy offense. He threw for 41 touchdowns with just 10 interceptions despite playing injured for much of the year. Mahomes is the fifth underclassman quarterback to declare for the draft, joining Clemson’s Deshaun Watson, Notre Dame’s DeShone Kizer, Miami’s Brad Kaaya and Virginia Tech’s Jerod Evans. North Carolina’s Mitch Trubisky is also expected to enter the draft, Notably, Washington State’s Luke Falk opted to return for his senior season. Mahomes recently underwent surgery on his non-throwing wrist. During his Tuesday press conference, he said he’d be able to train while wearing a splint and hopes to have “full motion” before the NFL combine. “I’m hoping with hard rehab I’ll be pretty much 100 percent at the combine,” Mahomes said. Mahomes submitted for his draft evaluation and told reporters he received a second-round grade. Overall in his career, Mahomes threw for 11,252 yards, 93 touchdowns and 29 touchdowns while completing 63.5 percent of his passes. The 6-foot-3, 230-pound Mahomes also rushed for 845 yards and 22 touchdowns in his three years at TTU. 0 Response to "Patrick Mahomes declares for 2017 NFL Draft"